A lot of giraffe-themed books have been popping up lately. Thanks to Laura at Tampa Bookworm for a giraffe book recommendation that sparked this post. I admit I have a soft spot for giraffes. Polar bears, giraffes, and lobsters are my top three favorite non-domesticated animals. Okay, add elephant in there. My four top favorite non-domesticated animals. Maybe I’ll post sometime in the future about books for the others, but today it’s all giraffes, all the time. 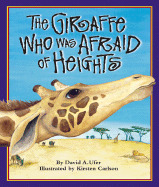 Laura recommended The Giraffe Who Was Afraid of Heights by David Ufer, illustrated by Kirsten Carlson (9781934359051, Sylvan Dell Publishing, $8.95). I haven’t read it yet, but I always appreciate the recommendation. 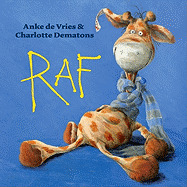 Though not primarily about a giraffe, this book does feature a giraffe on the cover. 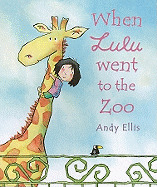 This is a sweet book about a little girl who doesn’t like seeing the caged animals, so she frees them and takes them all home to live with her, with some funny results. Raf is short for Giraffe, Ben’s favorite stuffed toy. Sort of like the traveling gnome from the Travelocity commercials, when Ben loses Raf, Raf starts sending Ben postcards from his travels with the people who found him. But the real question is, will Raf make it back to Ben in time for Ben’s birthday? Gerald is my favorite name for a giraffe, and this book is about a Gerald. The animals make fun of Gerald’s awkward dancing at a jungle party. Gerald mopes away in shame, but a special friend helps Gerald see there’s a type of music out there for everyone to dance to. 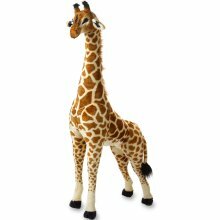 Last but not least, don’t miss out on the finger puppet book Little Giraffe by Klaartje van der Put (9780811867870, Chronicle, $6.99) and the Melissa & Doug, large, stuffed giraffe ($99.99).